Facebook celebrated it's 5th birthday this Wednesday and it's growing from strength to strength. I guess one of the reasons this online social network has become so popular are the wide choice of applications that anyone on the network can sign up for, depending on their interest. Definitely, the most popular applications are the games. Apart from Knighthood, my favourite game on Facebook, I have a few others on my profile. This includes Pet Society, a virtual world where your pet lives, eats, meet friends, play and buy stuff. 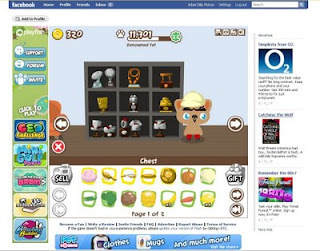 In case you are wondering how the developers make money from these game, just take a look at the Pet Society website. You can buy t-shirts, mugs and loads of other stuff. Once you open their application on Facebook, you can also visit the bank to buy coins using Paypal and other means of payment. You can then use the gold to buy stuff including virtual wallpaper and seasonal decorations. This is but one of the interactive games from Playfish.com. Other popular games include "Who has the biggest brain? ", "Word Challenge" and more. Unfortunately, this has become my daughter's favourite game as well and I would have to let her play with it every day after coming back from school. Looking at the bright side, she has a better understanding of money - how to earn it, spend it and more importantly - saving it. If you are on Facebook, do check out the game. i didnt know there's such a thing! adam, how did you do the facebook thing (collum/widget) what on earth do you call that thing at the bottom of the post with your picture on. nak letak kat blog. love to all in warwick! I will send you an invitation. This is Rahil's favourite game on Facebook.